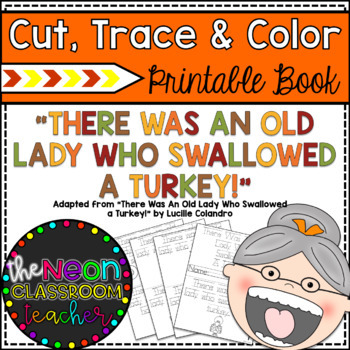 Included in this package is a 8-page (8.5 X 5.5 inch pages) adapted book from the Thanksgiving book "There Was An Old Lady Who Swallowed a Turkey" by Lucille Colandro! This printable book is a great book for those early learners. I created this book for my Pre-Kinders. I made it to be easily cut down the middle and then gathered and stapled to make a mini book. I have my little guys practice their cutting skills by cutting them along the dotted line and then they bring their pages to me to staple. After I staple them, they have to then write their name and trace over all the words. After tracing the words, they color the pictures, and we choral-read the book as a class and then they read it by themselves. After, they get to take them home and have a book they can read on their own!!! They are SO excited to go home and tell their parents they can read their own book! 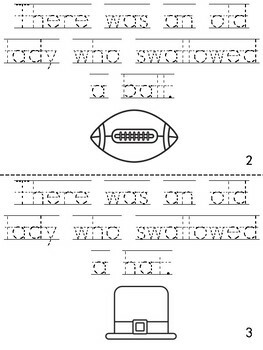 This would be great for Kindergarteners, First Graders and even ESOL students! Hope you enjoy them! Please let me know if you have any troubles downloading or if anything is wrong with any pages. Visit my store for more Cut, Trace and Color Printable Books!